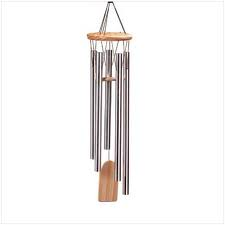 A delightful wind chime, which is sure to relax baby! The purity of sound created by the aluminium bars is thought to unblock negative energy pathways thus relieving tension. Attach the chime to the ceiling so that your baby can hear the sound as he or she lies in her cot below. Safety: not a toy - contains small parts. Adult supervision required if used as a sound instrument. Hang in a safe place out of your baby's reach.